Late Friday, Streetsblog SF presented a report about Muni changing to all-door boarding starting July 1st for the entire transit system. This would expand beyond the existing metro system's policies and would be the first in North America to establish such a major program. But as you all know, Akit isn't here to stand on the sidelines and cheer, he's got his own thoughts on this idea. If you are reading this blog entry, what else would you expect from this blogger? We all know the agency's buses are slow; it shouldn't take 45 minutes to go end to end on the 38L-Geary Limited, but that's what happens all the time. We all know Muni's average speed is a sluggish 8 MPH, in fact, you can probably ride a bike and make it to your destination faster. In theory, if we go with all-door boarding, passengers don't need to flood the front door of buses and wait in line to either pay in cash or tag their Clipper card. That should be able to reduce the time for boarding and encourage more passengers to spread out on the buses where many bunch-up in the front half and refuse to go to the rear. More people want a Clipper card to pay for their rides? Why not enjoy the benefit of tagging your Clipper card to enter a different door? This has to be the riskiest thing Muni will have to face. The honor system is not exactly the greatest idea in our city. When I ride the 38-Geary and see people boarding through the rear door, hardly anyone is tagging their Clipper card, or doing the "flash their pass/transfer" at the driver who isn't even paying attention to their rear mirror; and let's remember, this is happening today, before the new policy is in place! Also, with the possible plan to allow all of SF's youth to ride free (in which, I hate the idea), and that will cause even more turmoil. Youth could argue to inspectors and police: "why do I need to tag my Clipper card's free pass when you already allow all-door boarding?" If inspectors or cops decides to write a ticket to a person under 18, that's a trip down to the Juvenile Justice Center as per state law; that means backing up the already busy juvenile court system. I can understand Muni has card readers on their back doors, but only on one side. If a passenger boards the opposite side, they'd have to do the wrestling clothesline move to validate their Clipper card. Even on the metro lines, passengers complain there are too few card readers and passengers boarding a crowded train will have to get through a layer of people just to validate their card. Remember riding BART and you always let passengers exit first, and then you board? On Muni... HA! The Muni metro at Powell Street station is a perfect example of seeing old Chinese ladies shoving their way onto an outbound K-Ingleside train while dozens of other passengers are trying to exit FIRST. Even for me, I got off jury duty and rode the 8X to downtown, and I was about to exit when a Chinese lady decided to board the rear door illegally and sandwiched me into the stairwell's handrail just so she can board first. If Muni wants to do this, they need to teach passengers some respect. Let people exit first, then board the rear door. If you want to board first while I'm exiting, I don't mind blocking the doorway until you get the hell out of my way. All-door boarding is a good option for major bus lines and ones heavily used by the public. All the 38 Geary lines is a perfect example because 54,000 people ride the Geary lines on a single weekday at approximately a 75% on-time rate (stats from SF Examiner). By improving boarding times, the Geary lines can increase their on-time rate even higher, or if very successful, adjust their time schedules. But smaller lines like the 39-Coit, 18-46th Avenue, 17-Parkmerced, 3-Jackson, and a ton more doesn't need all-door boarding. If you think about it, if there's only a few passengers waiting at a bus stop, why not just let them board the front door? What if there was just one passenger? Why waste time and let them board the rear when the front door should be the primary way? If Muni plans to expand all-door, they need more fare inspectors. I can understand, if all-door expands to only major lines, hiring extra inspector teams to conduct inspections won't be so bad because they can still concentrate on the metro lines and the lines added to all-door boarding. Surely, they can still inspect the lines without all-door as surprise inspections just to keep people in check with the rules. If Muni decides to expand to the smaller lines, what a waste of resources it will be. If all-door boarding was on the 17-Parkmerced, I'd bet fare evasion would jump because fare inspectors would hardly ever do any fare checks, and those entering the back door could have a transfer that's fake, expired, or just nothing at all, and the driver would just assume the passenger is A-OK. The larger the number of all-door boarding lines, the more inspectors will be needed to keep passengers in check with obeying the honor policy. Or even worse, forcing inspectors to blanket the whole city to do fare checks on every single line of Muni to make sure of compliance of boarding the rear doors. What's easier is the smaller lines stick to regular policy, board the front doors only, and exit doors are just exit doors. The driver has full control to make sure every person who enters the front door has paid their fare, used a valid Clipper card, or has shown a paper transfer. Drivers are defacto fare inspectors with authority to halt a passenger who has an expired transfer or something else going wrong, so why hire tons more inspectors or thin out the inspector teams to cover the whole city, when an operator can do themselves? The F-Market is a tourist line and truly needs to stick with front door boarding. I'd say about 85% of visitors pay for the F-Market in cash, so by allowing rear-door boarding, that will say to tourists, "hey, my streetcar is free!" Very few passengers board with a Clipper card, so front door boarding needs to stay to make sure they collect the revenue to help fund the agency. If Muni wants all-door boarding for the F-Market, they need ticket machines. Put them at all the major stops so that it reduces dwell time for the vehicles (at the Ferry Building, it can take five minutes for everyone to board and pay cash). Muni could also consider having official ticket sellers at major stops during peak periods (weekends, Fleet Week, holidays, summer time) to encourage faster boarding. Lastly, Muni could consider bringing back the conductors that used to be on the streetcar lines many decades ago to check tickets and force new passengers to pay their fare. All these suggestions for the F-Market are expensive, but it reduces the risk of fare evasion. If it was up to me, I'd stick with front door boarding only as a cost effective measure. Plus, doing fare inspections on tourists would be torment on the inspectors, from people with various language barriers, and international visitors won't even pay-off the citation because will Muni really chase them for a $100 ticket if they are in France? Only implement on the major and most heavily used bus lines. Implement at all major stops, even for less popular routes where there's a lot of passengers waiting to board (e.g. SF State curb stops on 19th/Holloway). Do not allow all-door on smaller bus lines and the F-Market. Add pre-purchase ticketing machines at popular stops to encourage faster boarding. Educate passengers early on about the rules and courtesy to other passengers. Change the attitude of passengers about all-door boarding by discouraging fare evasion (does hypnosis work?). Change the penalty structure; instead of a $100 fine, add an incentive to pay within three weeks and it's cut to $50; youth who violate are still remanded to the juvenile court system as I strongly believe youth crime is the path towards future crimes (even the city says so). 1. SFTRU originally supported all-door boarding only on articulated (60") buses, because by they carry a lot of riders. However, there are other busy lines that would benefit, such as 22, 24. Also, on some lines like 14, sometimes they use regular 45" buses. Furthermore, the same bus is often used on multiple lines. Lastly, many people who ride community lines transfer from/to another line, which gives them a chance to be inspected. So SFMTA's take was that it would be a nightmare with mixed inconsistent messaging, if some lines/vehicles said you could board at the front door, and some said you couldn't. Yes, intuitively it may not make sense to implement all-door boarding on small community lines. However, the smaller the line, the smaller the losses from fare evasion. And Muni does plan to send fare inspectors to lines in proportion to their ridership/historical fare evasion. To us that was a reasonable take, so SFTRU decided to support the full-system proposal. 2. I agree that increased fare evasion is a risk that Muni has to take. However, let's not forget that we have a paradoxical system now. Because there is no official all-door boarding in place, Muni doesn't bother employing fare inspectors on buses. 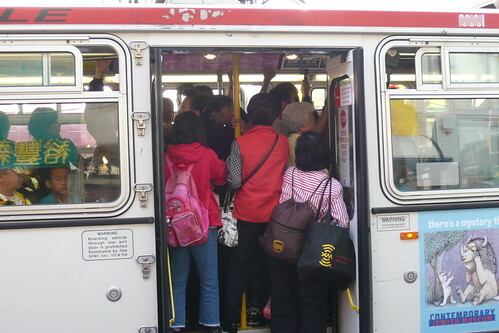 Because Muni doesn't bother and because rear-door boarding is illegal, 50% of those who now board at the rear door think that once they've boarded, they're good without paying. Employing fare inspectors will destroy that expectation - people don't have that expectation on the light rail lines, and that's why fare compliance there is higher. 3. We're talking to SFMTA about passenger courtesy. One thing Muni is planning is new signage indicating to those boarding to yield to those exiting. However, such signage may not be easy to read once the doors open, so we're looking at how this can be improved. 4. As for the F line, let me remind you that a lot of tourists use the CityPass or a passport, which are legal proof of payment. SFMTA is looking at ticket vending machines for Market St, which has a lot of lines, and has heavy tourist traffic. In fact SFMTA has a list of such locations, and is looking to long-term simplify use for tourists. However, Muni has decided and SFTRU agrees that it's not worth holding the proposal up before those are implemented. As a final point, remember Muni loses a lot more money NOT implementing all-door boarding, since service is slow. And remember that there is symbiosis between all-door boarding, proof of payment and ticket vending machines. They rarely make enough sense in isolation, however, if all-door boarding is employed, apart from its other benefits, it will motivate Muni to properly implement fare enforcement and to make it easy for everyone including tourists to buy fare media so that they don't evade fares. The presence of a driver will no longer be an excuse (it's always been a very poor excuse, but was able to fool a lot of the public). I'm for implementing all-door boarding on all lines. It would be entirely too confusing to have some buses where you can board from any door and some where trying to get on through the back door can net you a $100 fine. Many of the community routes you mention are used as feeder service to the Metro and other bus lines, so even if someone doesn't pay their fare, say, getting on the 17-Parkmerced, they'll wind up paying at West Portal when they transfer. The F-Market would be greatly aided by deploying staff to key boarding platforms at peak times to collect fares and give information. A couple agents along the route could speed up boarding and provide fare enforcement without the expense and trouble of staffing conductors on board the trollies.